I’m pretty much done on Zhucheng for now, but there are a couple of last little bits that I wanted to show on here that didn’t really fit anywhere else so they’re getting dumped in this post. 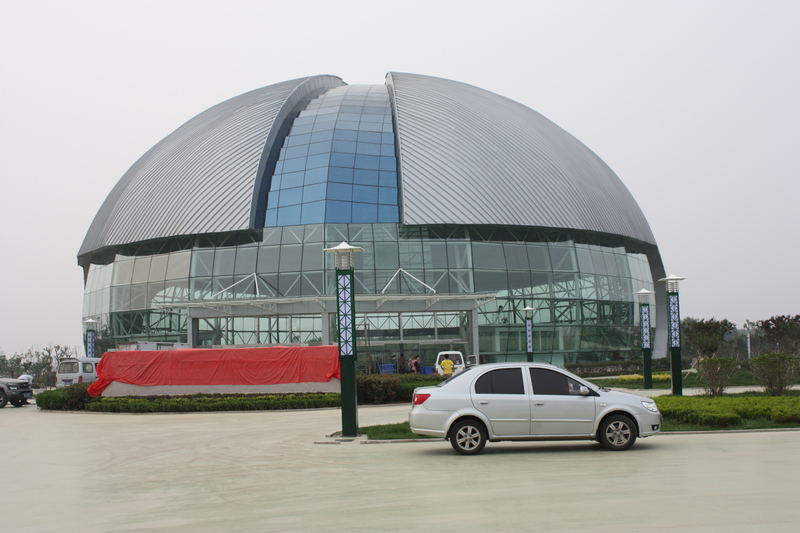 Above is the first completed building at the site, the ‘Tyrannosaur hall’. 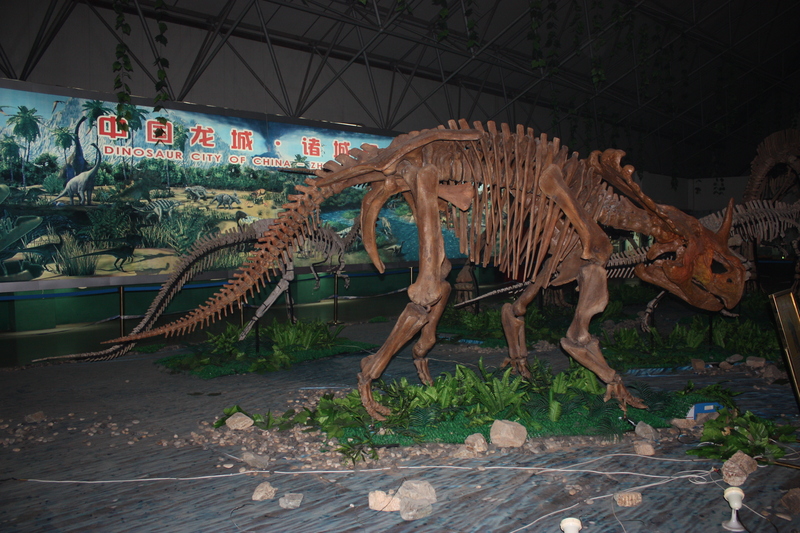 It’s build over the site where Zhuchengtyrannus was found, but I don’t actually know what’s going to be on display in there. 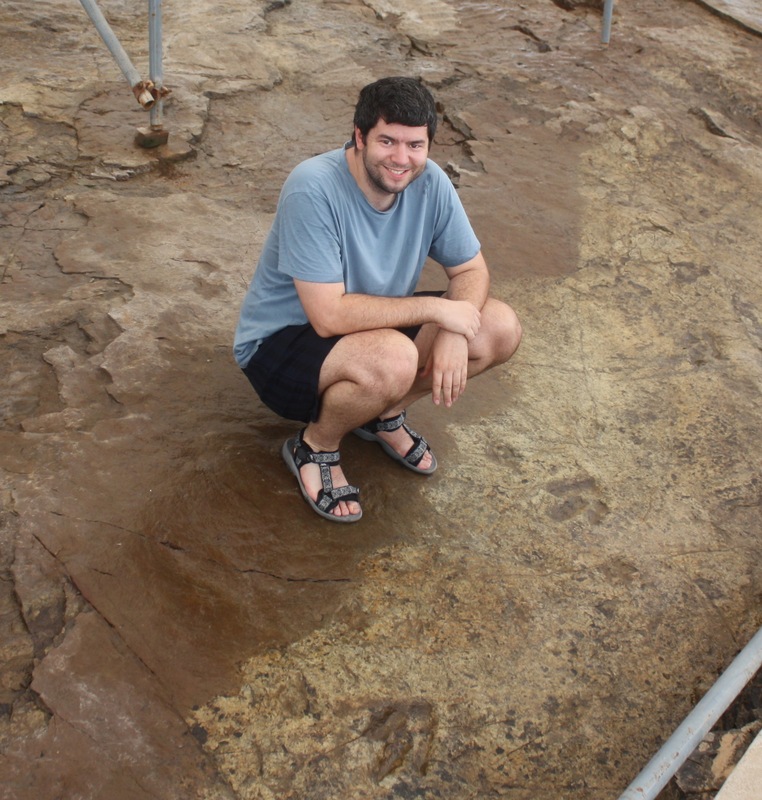 Below is a photo from the recently described tracksite that is nearby, you should be able to see a couple of medium-sized theropod tracks in association with H. sapiens. 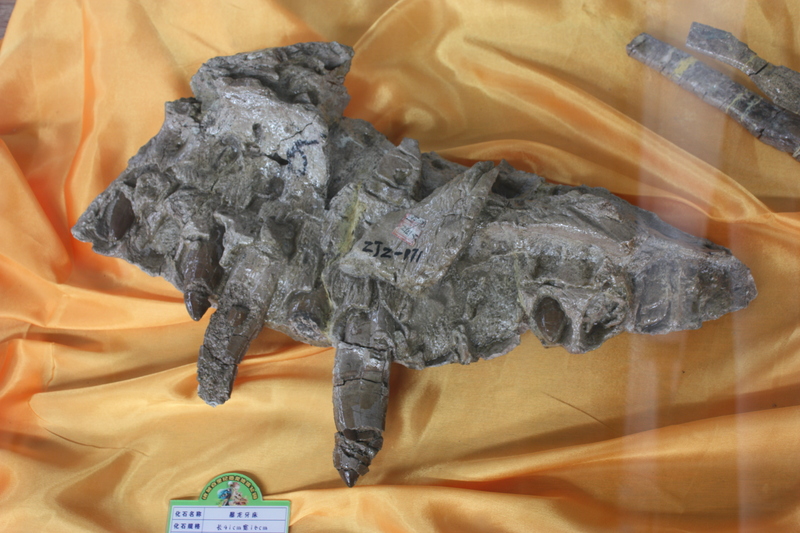 Finally, waaay back when with the original description of Zhuchengtyrannus came it, we were rather reliant on photos and casts of the maxilla because of some quite horrendous damage to the bone that can be clearly seen here (3rd image done, part A). However, extensive repair work has now taken place and it’s now close to it’s former glory (as much glory as an incomplete maxilla can have anyway….). And here is a picture of the restored piece. It’s of the medial side and while that’s not the prettier one, it should be clear that the major and minor pieces have been stitched back together and the teeth restored and so on. Obviously it’ll never be quite as good as it once was, but it’s now considerably better than when I last saw it and a perfectly respectable specimen as they go. 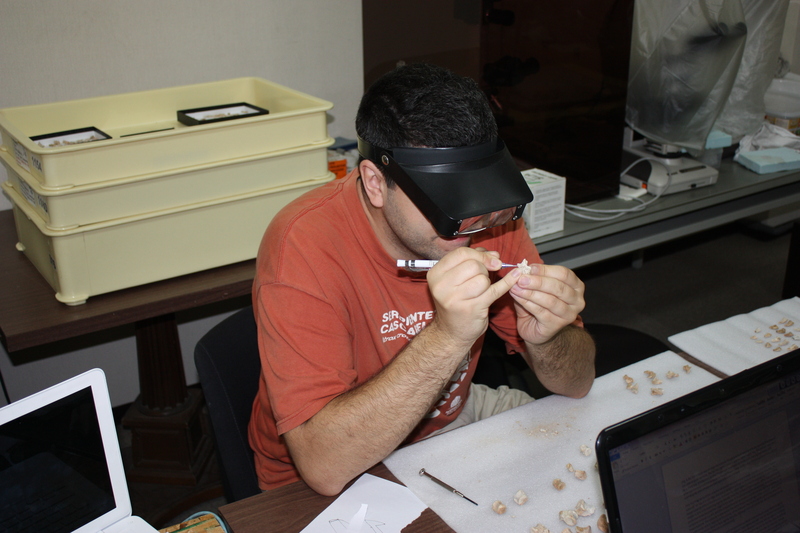 That it, it is certainly better than a few holotypes I can think of, and that’s a start. Well I’m back in Beijing and about to head into the field. 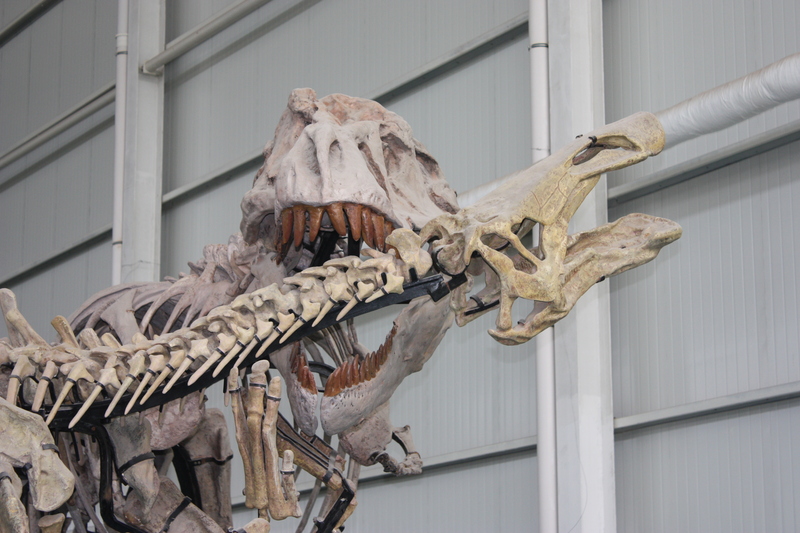 In the last 2 weeks I’ve taken in the Hayashibara Museum in Okayama, the National Museum of Nature and Science in Toyko (plus their incredible Dino Expo 2011) and a couple of zoos and aquaria as well as a bird sanctuary. As a result I have an absolute ton of posts lined up including some nice photos of new and interesting mounts and rarely seen taxa and specimens. Obviously that’s going to be on hold while I’m out and unavailable so you’ll have to hold on for a bit longer, but my more normal, daily, service should be resumed soon. This is just a quickie to finish off the last of the Hayashibara stuff before I get back to China and vanish into the field. 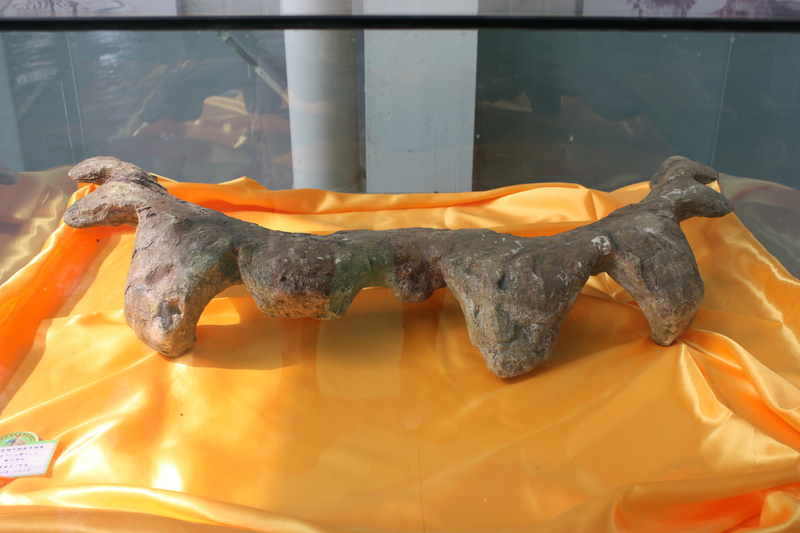 In addition to the superb Saurolophus featured the other day, the museum has cast most of the elements and there are various mounts of pieces hanging around the place. Here’s the lower part of a hindlimb and foot, which rather better shows off the material then a few bits lying on the ground. Again, the quality is superb and even without a scalebar, it’s quite clear just how big this is. 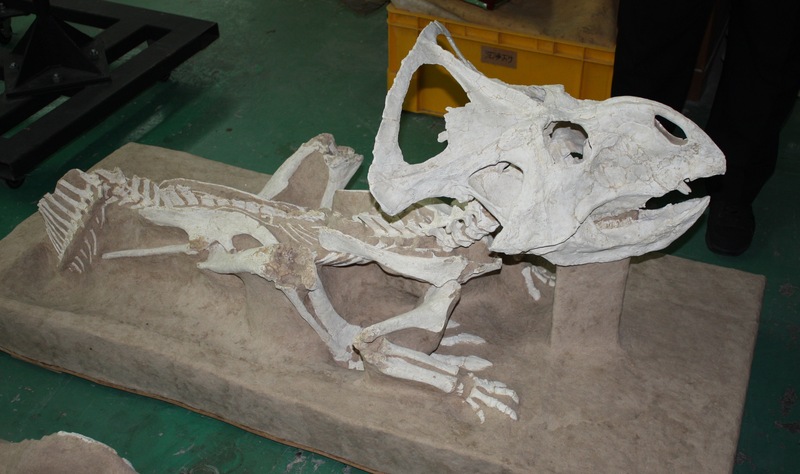 So you might be getting a bit sick of Protoceratops specimens at the moment, but this one is a bit special. Based on the first picture you can see that like some of the others, it’s nearly complete, well articulated and in good condition. The pose might look a little odd, but this is because of how it has been left to facilitate preparation. When orientated as found in the field (and as originally preserved) we see something rather more dramatic. Yep, it looks rather like this animal was buried and tried, and failed, to get out. The formation is apparently made up of aeolian (wind deposited) sediments, so this is not something that drowned or was buried in a river channel etc., but was trapped in a sandstorm, collapsing sand dune or something similar. The head is up and the body down, implying that it survived long enough to try and make an escape but never succeeded. There are, apparently (I’ve not seen them) a number of specimens like this in other collections, and I’d love to see if there are any studies on how often this thing happens now, though I dare say it’s an incredibly hard thing to find out. 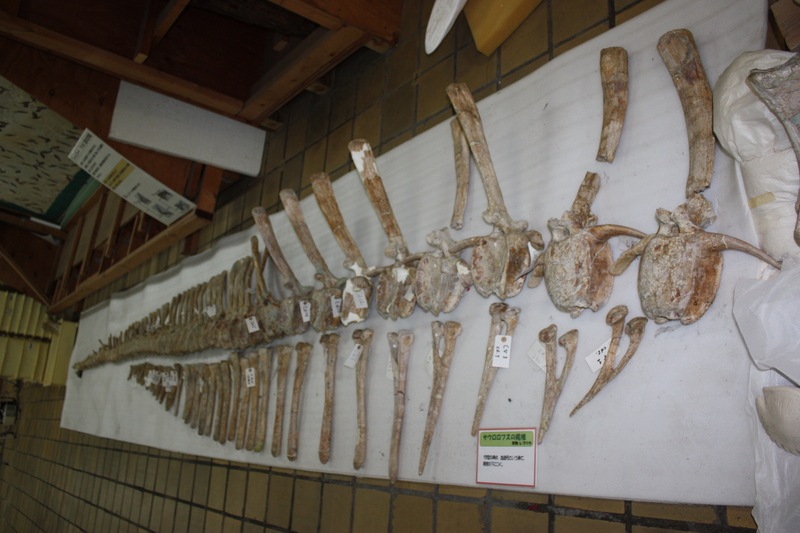 This specimen may not be immediately familiar, but those who know my work well will certainly know the humerus. 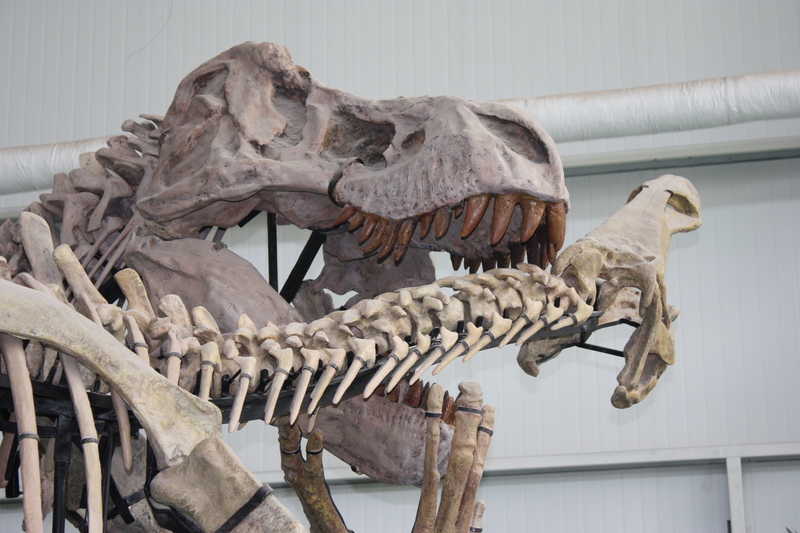 This is the specimen that was chomped on and led to my paper on tyrannosaur scavenging. 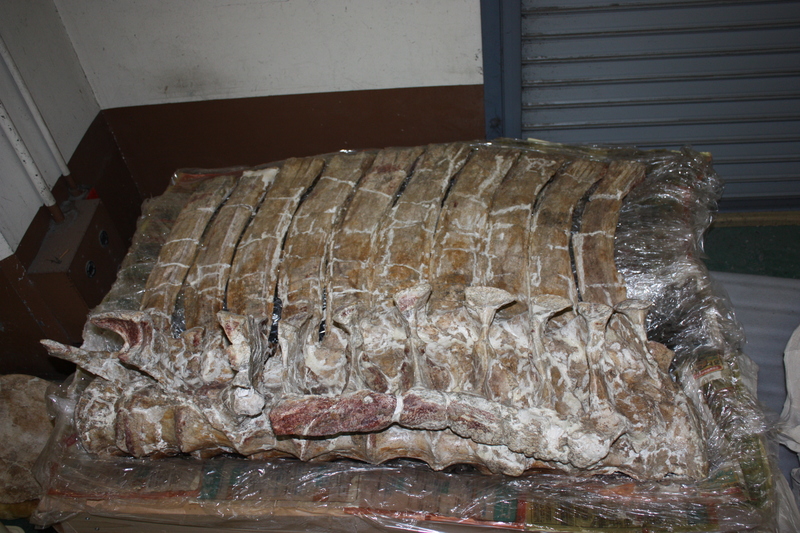 As noted there, one major aspect of the paper was that the rest of the material was in otherwise excellent condition, implying that that the carcass was unavailable for consumption – this was scavenging of a dead animal and not simply late-stage carcass consumption. So here is the rest of that specimen (well most of it) and as you can see it’s both a large individual and in wonderful condition. 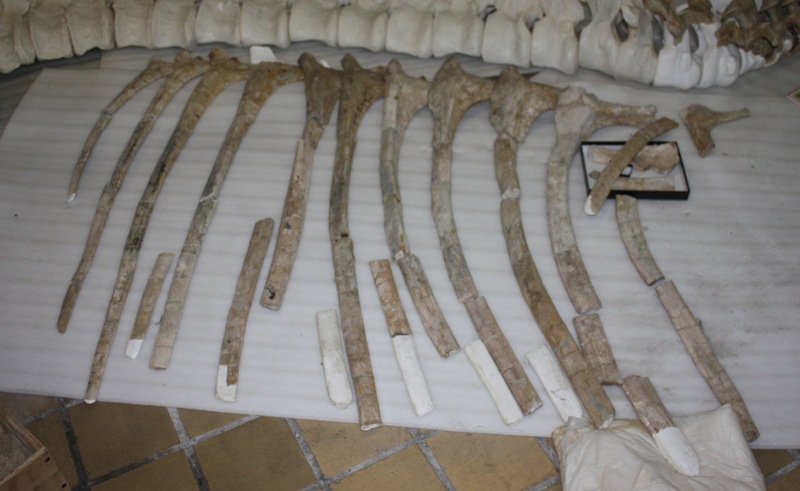 The bone surfaces are superb, the vast majority of it is preserved, and there are even small elements like gastralia and some skin in there too (and some 62 consecutive caudals!). The size meant that I took a number of photos for this post simply because to try and fit it all in otherwise (as with the top image) leads to all manner of parallax and that hardly serves the best well. Long time readers will remember my worried post about the Hayashibara museum in Okayama where I have been spending my last few days catching up and working to get projects both started and completed. The good news is that the Hayashibara is no longer in any immediate danger of closure, the bad news is that it is still in danger of being permanently shut down in the not too distant future. As I understand it, the company has not closed down the museum despite their bankruptcy, hence the immediate stay of execution. However, the company itself is now up for sale and will be sold by the end of the year. 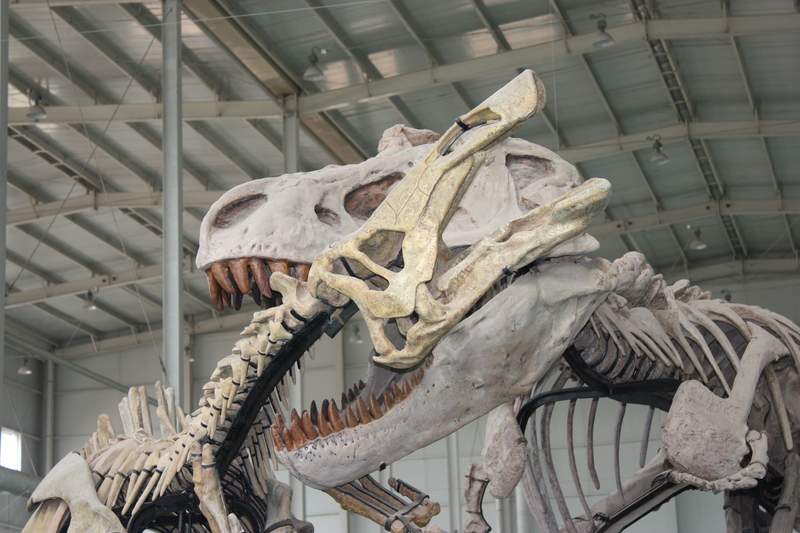 It then depends on the new parent company what happens to the dinosaur museum. Obviously they may not consider it a going concern (understandably, if unfortunately) so things are stable, but far from rosy. This ongoing crisis in part prompted my return to the collections – a chance to see and work on them while I still could. 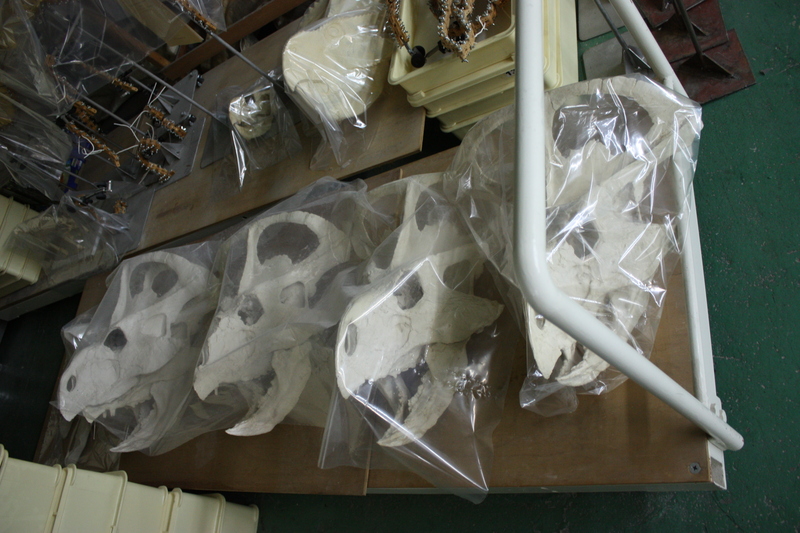 It’s been great but stressful (too much to do, too little time), but most importantly for the blog, I’ve been given permission to publish a stream pf photos of various Hayashibara specimens. This includes a bunch of unpublished material, though as these are all of well-known taxa I’m not giving anything away. 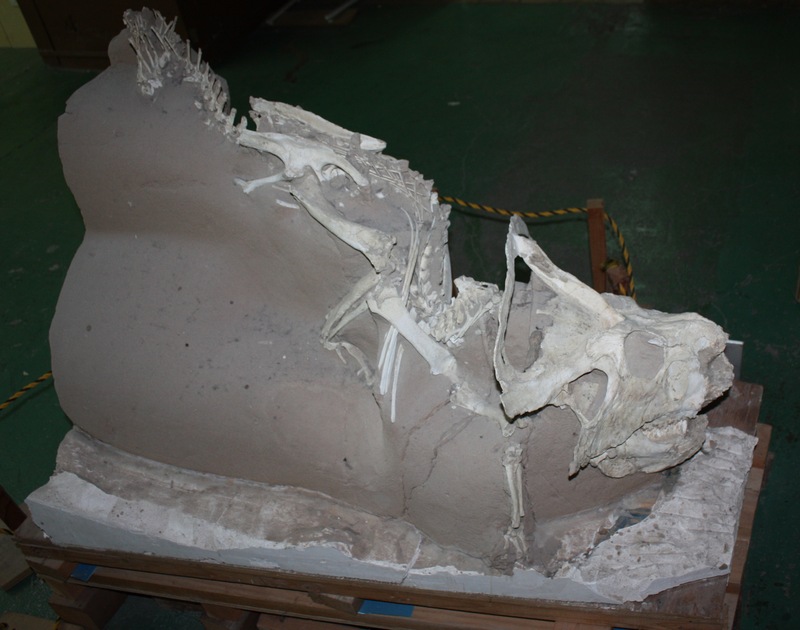 For starters, here’s a series of casts of a lovely big Protoceratops skull. 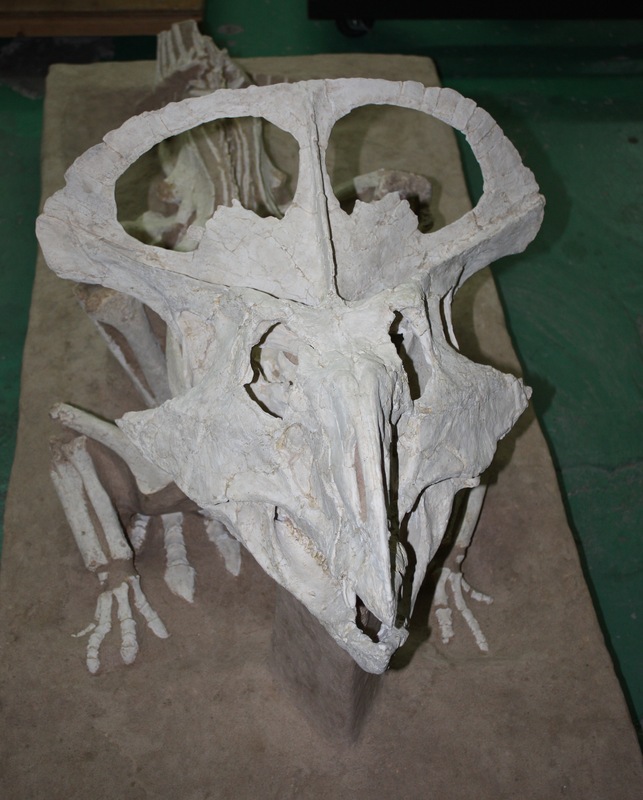 The original specimen is complete and articulated and will be coming soon. I showed a collection of casts of this superb specimen the other day, and now here’s the whole thing. 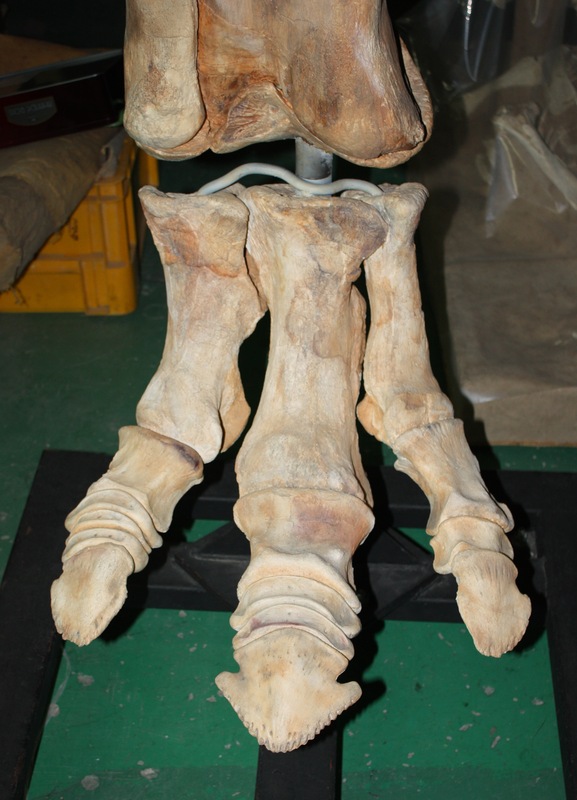 Preserved in a kind of sitting position, this is an amazingly complete and well-articulated specimen. 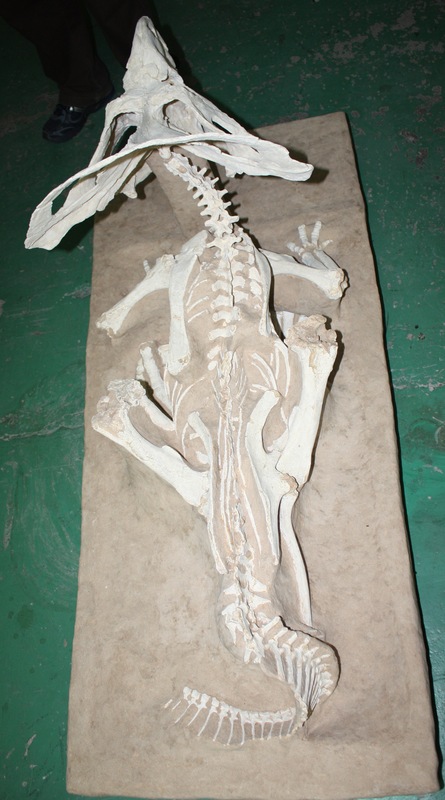 The posture is unlikely to be *quite* original – the animal must have been buried while pretty fresh and obviously as the skin and muscles etc. rot the sediment will shift and settle and the limbs especially might well ‘drop’ relative the the rest of the material and help produce this ‘squatting’ posture. This is one of the nicest specimens I’ve ever seen and has a lovely and well developed crest and jugal bosses which is great to see as well. Some nice details like the large anterior teeth and some ossified tendons are also clearly visible. I’m still in Japan for now, explaining the low post rate for the last few days. 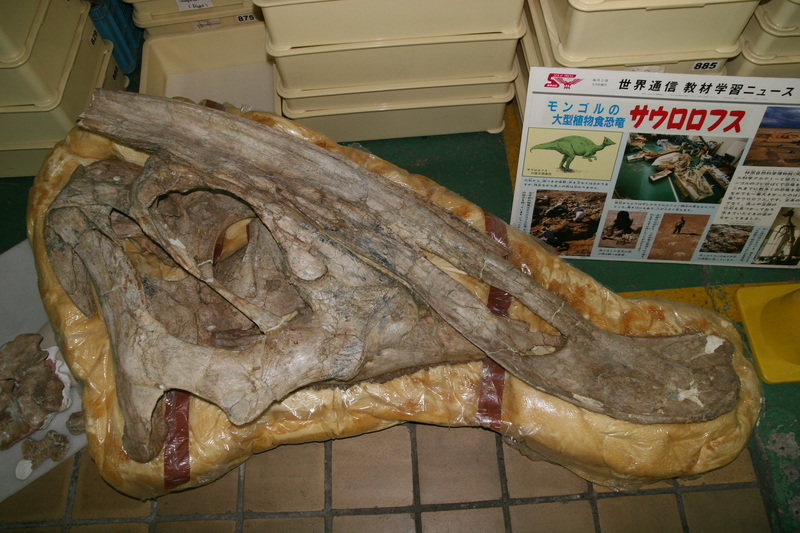 I’ve been very busy at the Hayashibara museum in Okayama going over ornithomimids, oviraptorosaurs, troodontids, tyrannosaurs, alvarezsaurs, hadrosaurs, ceratopsids, ankylosaurs and more. Here’s me cleaning out a small oviraptorosaur caudal with a dental pick to get to the lovely bone underneath some clinging matrix. I’ve just arrived in Tokyo and have a few posts lined up so the next few days should be rather better than recent weeks. Stay tuned. 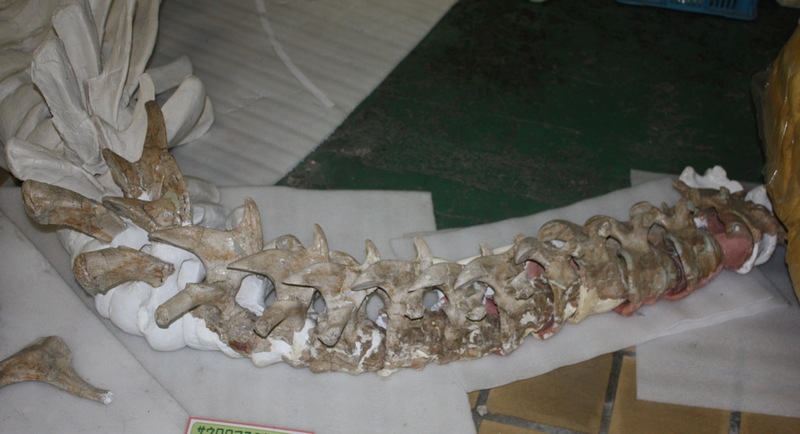 Guest post: when pachycephalosaurs attack. Today Eric Snively takes us through hi very recent PLoS One paper on head-butting in pachycephalosaurs. Eric is linked to Larry Witmer’s lab, so it’s no surprise that this is a paper heavy on function and analysis, though he started this work while still based in Canada with Phil Currie’s group. The idea that these dinosaurs may have fought each other by butting heads, or even just smashing into an opponent’s flanks have been around for ages and gone back and forth many times. Here Eric shows how the head of Stegoceras was apparently adapted for hard impacts in a way otherwise only found in heed-butting animals. Apart from a drive-by illustration, I never really mentioned Sinoceratops although it was an important discovery. 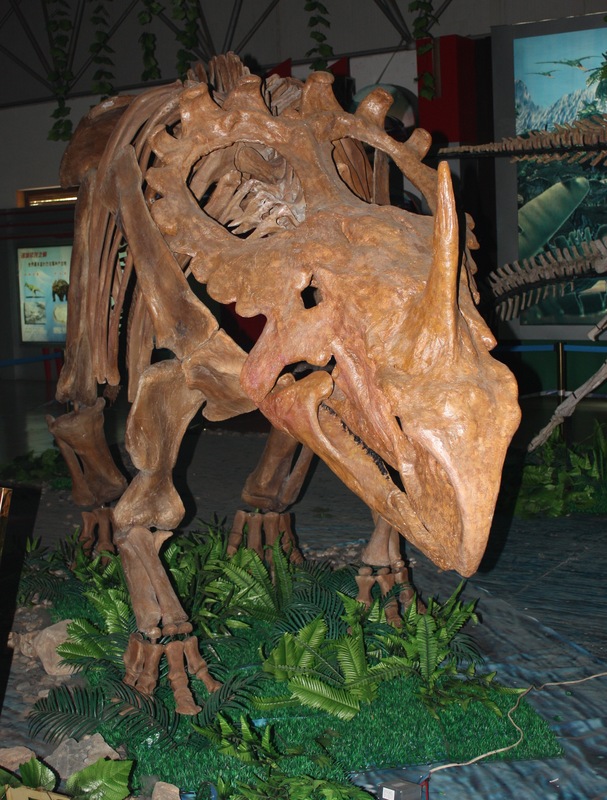 The Late Certaceous faunas of North America and eastern Asia were very similar indeed, though generally with one major exception: there were no derived ceratopsians in Asia. Well, not until the centrosaurine Sinoceratops turned up and rather completed the set of things like hadrosaurines, pachycephaosaurs, oviraptorosaurs, tyrannosaurines, parvicursorines, dromaeosaurs and the rest. 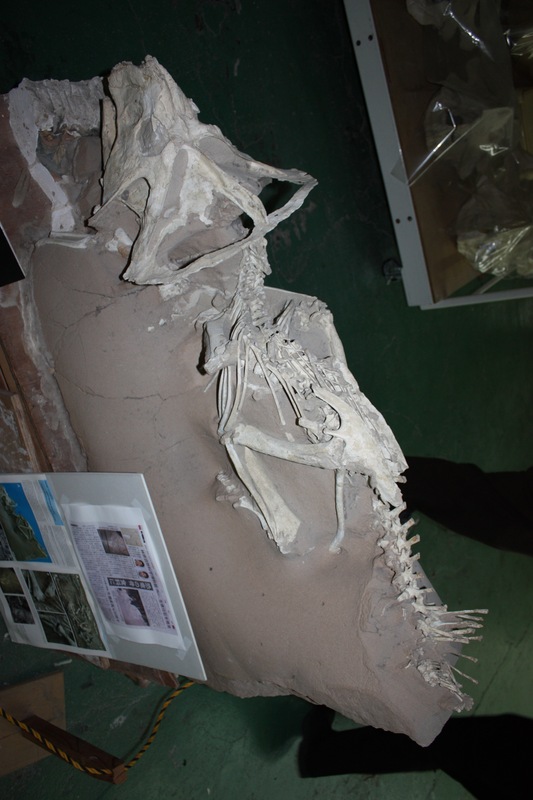 Anyway, above there is the upper part of the skull and the posterior part of the frill. 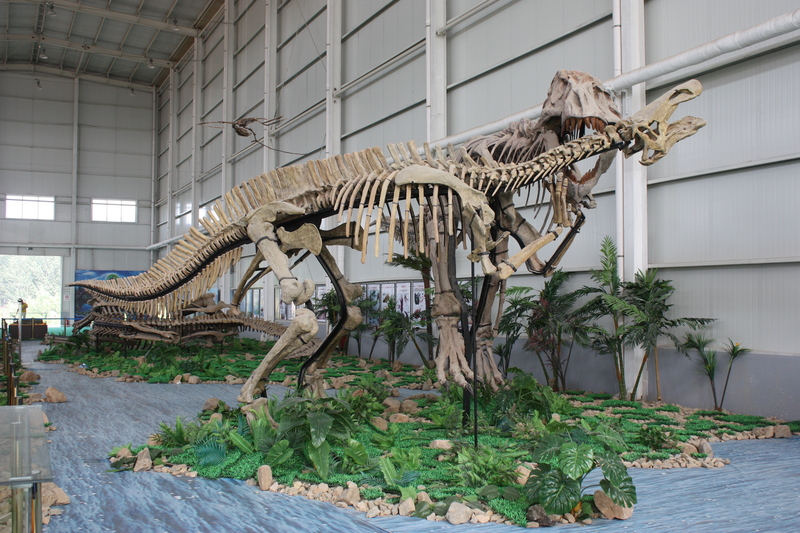 Below is a reconstructed skeleton of the beast on display.